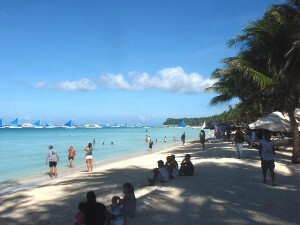 Wikipedia describes Boracay Island as the “top destination for tranquility and nightlife”. Well, I have been there and I found a lot of hotels, restaurants, very many dive centers managed by almost any nation (German, UK, Switzerland, Japanese and many more) and also a lot of tourists, even I was there just before the beginning of the high season end of October. Located in Boat Station 3, White Beach Divers Hostel is a perfect starting point from which to explore Boracay Island. The hotel offers a wide range of amenities and perks to ensure you have a great time. Smoking area, Wi-Fi in public areas, bar/pub, restaurant, safety deposit boxes are there for guest’s enjoyment. Guestrooms are fitted with all the amenities you need for a good night’s sleep, including fan, internet access – LAN, refrigerator, satellite/cable TV, shared bathroom. Recuperate from a full day of sightseeing in the comfort of your room or take advantage of the hotel’s recreational facilities, including massage, water sports (non-motorized). Convenience and comfort makes White Beach Divers Hostel the perfect choice for your stay in Boracay Island. Calypso Dive Resort is conveniently located in the popular Boat Station 3 area. The hotel offers a wide range of amenities and perks to ensure you have a great time. Take advantage of the hotel’s bar/pub, Wi-Fi in public areas, coffee shop, restaurant, smoking area. The well-appointed guestrooms feature shower, balcony/terrace, fan, seating area, mini bar. Enjoy the hotel’s recreational facilities, including outdoor pool, water sports (non-motorized), before retiring to your room for a well-deserved rest. Convenience and comfort makes Calypso Dive Resort the perfect choice for your stay in Boracay Island. At Calypso Diving, a PADI 5-Star IDC Center and National Geographic Dive Center, we provide diving safaris and PADI courses at all levels. Guests can dive in and discover the fabulous marine life of the coral reefs.. Dive Gurus Boracay Beach Resort is perfectly located for both business and leisure guests in Boracay Island. The hotel offers guests a range of services and amenities designed to provide comfort and convenience. Airport transfer, Wi-Fi in public areas, room service, family room, bar/pub are on the list of things guests can enjoy. Non smoking rooms, television, coffee/tea maker, internet access – wireless (complimentary), desk can be found in each guestroom. The hotel offers various recreational opportunities. No matter what your reasons are for visiting Boracay Island, Dive Gurus Boracay Beach Resort will make you feel instantly at home. DiveGurus Boracay has been delighting certified divers with personal and knowledgeable fun dives around Boracay Island since 2000. Since that time, hundreds of divers of many different levels have experienced the warm and friendly DiveGurus service – diving with a smile! Boracay Tourist’s Inn is conveniently located in the popular Boat Station 1 area. The hotel offers a wide range of amenities and perks to ensure you have a great time. Laundry service/dry cleaning, airport transfer, Wi-Fi in public areas, tours, room service are on the list of things guests can enjoy. Each guestroom is elegantly furnished and equipped with handy amenities. Recuperate from a full day of sightseeing in the comfort of your room or take advantage of the hotel’s recreational facilities, including water sports (motorized), water sports (non-motorized), massage. A welcoming atmosphere and excellent service are what you can expect during your stay at Boracay Tourist’s Inn. Aquarius Marina Boutique Hotel is conveniently located in the popular Boat Station 1 area. The hotel offers guests a range of services and amenities designed to provide comfort and convenience. All the necessary facilities, including coffee shop, airport transfer, bar/pub, room service, babysitting, are at hand. Guestrooms are designed to provide an optimal level of comfort with welcoming decor and convenient amenities like balcony/terrace, in room safe, hair dryer, laptop safe box, internet access – wireless. The hotel offers various recreational opportunities. No matter what your reasons are for visiting Boracay Island, Aquarius Marina Boutique Hotel will make you feel instantly at home. Set in a prime location of Boracay Island, Maxima De Boracay Hotel puts everything the city has to offer just outside your doorstep. Featuring a complete list of amenities, guests will find their stay at the property a comfortable one. All the necessary facilities, including room service, tours, smoking area, 24hr room service, Wi-Fi in public areas, are at hand. Guestrooms are fitted with all the amenities you need for a good night’s sleep, including complimentary bottled water, satellite/cable TV, shower, in room safe, hair dryer. Take a break from a long day and make use of water sports (motorized), water sports (non-motorized), massage. A welcoming atmosphere and excellent service are what you can expect during your stay at Maxima De Boracay Hotel. Set in a prime location of Boracay Island, Sulu Plaza puts everything the city has to offer just outside your doorstep. Offering a variety of facilities and services, the hotel provides all you need for a good night’s sleep. Take advantage of the hotel’s laundry service/dry cleaning, tours, Wi-Fi in public areas, family room, restaurant. Guestrooms are designed to provide an optimal level of comfort with welcoming decor and convenient amenities like internet access – wireless, shower, in room safe, television, satellite/cable TV. The hotel offers various recreational opportunities. Sulu Plaza combines warm hospitality with a lovely ambiance to make your stay in Boracay Island unforgettable. The Boracay Beach Resort is a popular choice amongst travelers in Boracay Island, whether exploring or just passing through. The hotel offers a wide range of amenities and perks to ensure you have a great time. Facilities like room service, restaurant, tours, babysitting, bar/pub are readily available for you to enjoy. Guestrooms are fitted with all the amenities you need for a good night’s sleep, including internet access – wireless (complimentary), non smoking rooms, hair dryer, balcony/terrace, bathrobes. Enjoy the hotel’s recreational facilities, including massage, water sports (non-motorized), garden, before retiring to your room for a well-deserved rest. Discover all Boracay Island has to offer by making The Boracay Beach Resort your base. Marzon Beach Resort Boracay is perfectly located for both business and leisure guests in Boracay Island. Featuring a complete list of amenities, guests will find their stay at the property a comfortable one. To be found at the hotel are airport transfer, safety deposit boxes, coffee shop, restaurant, room service. Designed for comfort, guestrooms offer non smoking rooms, air conditioning, internet access – wireless (charges apply), daily newspaper, television to ensure a restful night. Entertain the hotel’s recreational facilities, including garden. Friendly staff, great facilities and close proximity to all that Boracay Island has to offer are three great reasons you should stay at Marzon Beach Resort Boracay. Located in Boat Station 1, Residencia Boracay Hotel is a perfect starting point from which to explore Boracay Island. Both business travelers and tourists can enjoy the hotel’s facilities and services. Service-minded staff will welcome and guide you at the Residencia Boracay Hotel. Guestrooms are fitted with all the amenities you need for a good night’s sleep, including non smoking rooms, television, air conditioning, satellite/cable TV, shower. Access to the hotel’s garden, massage will further enhance your satisfying stay. Discover all Boracay Island has to offer by making Residencia Boracay Hotel your base. Stop at Boracay Ocean Club Beach Resort to discover the wonders of Boracay Island. The hotel offers a wide range of amenities and perks to ensure you have a great time. Facilities like safety deposit boxes, restaurant, poolside bar, 24hr room service, laundry service/dry cleaning are readily available for you to enjoy. Relax in your comfortable guestroom, featuring mini bar, hair dryer, separate shower and tub, television, coffee/tea maker. The hotel’s peaceful atmosphere extends to its recreational facilities which include outdoor pool, spa, massage, pool (kids). Boracay Ocean Club Beach Resort is an excellent choice from which to explore Boracay Island or to simply relax and rejuvenate. Ideally located in the prime touristic area of Boat Station 2, Best Western Boracay Tropics Resort promises a relaxing and wonderful visit. The hotel offers a high standard of service and amenities to suit the individual needs of all travelers. Facilities like Wi-Fi in public areas, meeting facilities, airport transfer, restaurant, safety deposit boxes are readily available for you to enjoy. Guestrooms are fitted with all the amenities you need for a good night’s sleep, including satellite/cable TV, non smoking rooms, kitchenette, desk, balcony/terrace. Recuperate from a full day of sightseeing in the comfort of your room or take advantage of the hotel’s recreational facilities, including outdoor pool, spa, garden, massage, kids club. Convenience and comfort makes Best Western Boracay Tropics Resort the perfect choice for your stay in Boracay Island. Set in a prime location of Boracay Island, Sea Wind Resort puts everything the city has to offer just outside your doorstep. The hotel offers guests a range of services and amenities designed to provide comfort and convenience. Service-minded staff will welcome and guide you at the Sea Wind Resort. Designed and decorated to make guests feel right at home, each room comes with shower, coffee/tea maker, daily newspaper, mini bar, non smoking rooms. Take a break from a long day and make use of water sports (motorized), garden, massage, outdoor pool, pool (kids). Friendly staff, great facilities and close proximity to all that Boracay Island has to offer are three great reasons you should stay at Sea Wind Resort. True Home Hotel is a popular choice amongst travelers in Boracay Island, whether exploring or just passing through. The property features a wide range of facilities to make your stay a pleasant experience. All the necessary facilities, including airport transfer, safety deposit boxes, tours, Wi-Fi in public areas, family room, are at hand. Each guestroom is elegantly furnished and equipped with handy amenities. The hotel’s peaceful atmosphere extends to its recreational facilities which include water sports (non-motorized), water sports (motorized), garden, massage. True Home Hotel is an excellent choice from which to explore Boracay Island or to simply relax and rejuvenate.